Treaties are agreements between sovereign nations. Native American nations, which are sovereign, or independent nations, as recognized by the US Constitution, entered into hundreds of treaties with the US government from 1778 to 1867. From 1785 to 1867 the US signed more than 40 treaties with the Ojibwe people. In exchange for land and mineral rights, tribes retained hunting, fishing, and harvesting rights on the land that they had ceded. These rights were actually the lifeways of the Ojibwe, which they had been practicing for centuries and which ensured their survival. The treaties also included annuity payments, debt payments, and payments to individuals of the tribes. The two most significant treaties that involved the Mille Lacs Band Of Ojibwe were the treaties of 1837 and 1855. 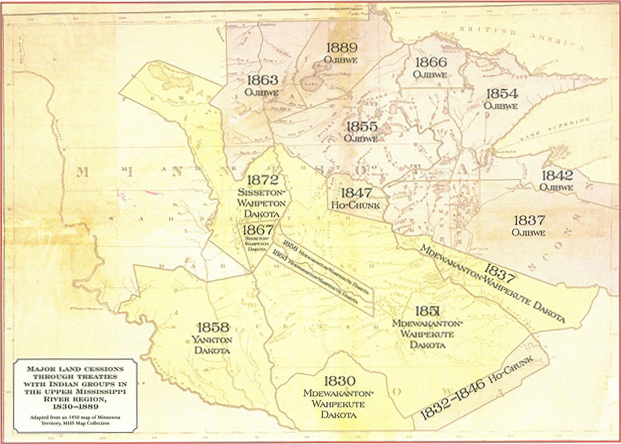 The treaty of 1837 ceded much of the land around Mille Lacs Lake. The treaty of 1855 set aside 61,000 acres for a reservation on and around the south end of the lake. Learn more about the US treaties with Ojibwe and Dakota people at the companion website to the Why Treaties Matter exhibit, which traveled throughout Minnesota in 2011-2012. Also, explore the Treaties section of the U.S.-Dakota War of 1862 website, which focuses on treaties with both the Ojibwe and the Dakota. As sovereign nations, tribes have the power of self-governance, or the right to establish their own form of political and legal authority. Other rights that tribes have include the right to determine tribal membership, the right to establish their own police force, the right to charter business organizations, and the right to administer their own judicial system. The last right means that tribal members cannot be sued in state court without waiving their sovereign immunity.